Over 42 years, "Boss of Bosses" Bernardo Provenzano became a legend in the Italian imagination; a fugitive who time after time escaped the police net, both at home and abroad. But on 11 April 2006, his luck suddenly ran out. 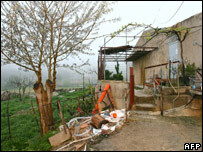 He is said to have been captured by police in a Sicilian farmhouse, wearing jeans and a pullover, now an old man of 73. 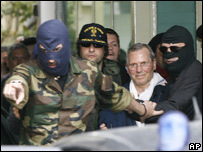 Provenzano has been convicted in absentia of a string of murders, including the 1992 killings of two judges, Giovanni Falcone and Paolo Borsellino, for which he was sentenced to life in jail. He is known as U Tratturi (The Tractor) - because, as an informant put it, "he mows people down". But the Sicilian was also a careful operator, who took few overt risks and under whose leadership the Mafia became a less bloodthirsty, more efficient machine, commentators say. For these reasons, he was also dubbed The Accountant. 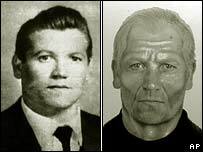 Bernardo Provenzano was born on 31 January 1933 in Corleone, a Sicilian town synonymous with mafia activity (and which gave its name to the fictional family in the Godfather films). He is said to have joined the mafia in his late teens, after World War II. With his friend Toto Riina, Provenzano is said to have become muscle for ambitious rising mafioso Luciano Liggio - who reportedly once said Provenzano had "the brains of a chicken but shoots like an angel". Rivalry between Liggio and Corleone clan head Michele Navarra erupted into all-out war in the 1950s, and in 1958 Provenzano is alleged to have helped Liggio murder Navarra, leaving Liggio as head of the Family. In 1963 Provenzano went on the run after an arrest warrant was issued against him for the murder of one of Navarro's men. In 1974, Liggio went to prison, leaving Toto Riina in charge with Provenzano his right-hand man. Riina was captured in 1993 and sentenced to life in prison. Provenzano took the helm. Riina had overseen a vicious internecine power struggle in the early 1980s which had left hundreds of mafiosi dead. But under Provenzano the organisation shifted course. He reportedly tried to arbitrate between rival mafia factions competing for business, and steered away from the attacks on high-profile figures that were hardening public opinion against the Mafia and provoking police to respond. Meanwhile, Provenzano adopted an almost feline caution, shunning the telephone and issuing orders through small, hand-delivered notes - "pizzini" - and revealing his whereabouts to only a handful of associates. Since taking the leadership, he is even said to have communicated with his wife and two sons in Corleone via pizzini - avoiding the dangerous holiday visits risked by other mafiosi. During this time, there were persistent rumours that he had died - a claim repeated by his lawyer only last month. But anti-Mafia prosecutors insisted he was still alive - and pointed to DNA evidence they say they uncovered after Provenzano visited a French clinic for treatment in 2003. Provenzano's aura of invulnerability is now dashed. The old untouchable now faces the rest of his life in jail.